Though we were raised Moslem, we’ve always celebrated the traditions of Christmas. One of our most fond memories is of the holiday in 1976, when we sat with our Afghan dad and carefully painted wooden sleigh ornaments. Today those ornaments hang on our own trees. Both of our parents have very large families, so we have easily 50 first cousins, and growing up, we took for granted that we were with our cousins all of the time. As we have had our own children, we yearn to create those same memories for them. But, as life has gotten busier and everyone’s schedules more compacted, making those cousin encounters frequent takes more thought, more work. Thankfully, they happen often and there is nothing more rewarding than seeing our children delight in each other’s company. Three years ago, we began a cousin’s tradition of decorating gingerbread houses. We got the cider going, played holiday tunes, and gathered round the table to decorate little cookie homes, usually eating half of the candy set aside for decorating along the way. This year, we decided to take a page from our own childhood and turn this annual get together into an ornament-making afternoon. Yasmine took a late night trip to Michael’s to pick up goods— plain ornaments, reindeer moss, tiny sisal trees, mini presents, small metal sleighs. It wasn’t an expensive stop; on average, the items cost about $2 – $3, with the most expensive being the moss at $7 for a large bag. 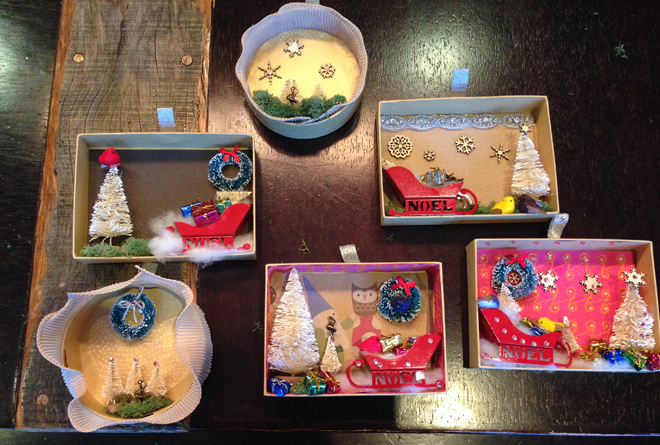 The next day, our kids sat around her kitchen table, intently placing tiny objects into the “diorama” small craft paper ornament boxes. Aside from operating the hot glue gun, we let the kid’s take the lead. Each ornament turned out unique, a reflection of their little personalities. By the day’s end, the kids were thinking about next year’s ornaments. What did we get out of the day? New decorations for our tree, yes, but more important, time spent together, time we know our kids will recall just as we remember painting little scenes of mountaintops on our sleighs with our father. Our hope is that the miniature worlds they created will spark memories of this precious time in life. As you all scramble between stores, angling for parking spaces, negotiating crowds and trying to cling to the holiday spirit, we recommend you take just a minute to come up with a fun tradition for your family to enjoy. Whether it’s making gingerbread houses, ornaments, or just spending time sharing stories from your year, making memories is what makes the holidays count.